Whether your packaging challenge is about powders, liquids, bulk products, confectionary, dairy, meat, fish, IQF products - the hygienic aspect is one of the key factors in your production. AGILIS vffs packaging machines by baumannpacking are designed to strictly meet even highest hygienic demands. AGILIS vffs packaging machines can be customized to your specific needs. The modularity allows a tailored machine layout adapting to your request. 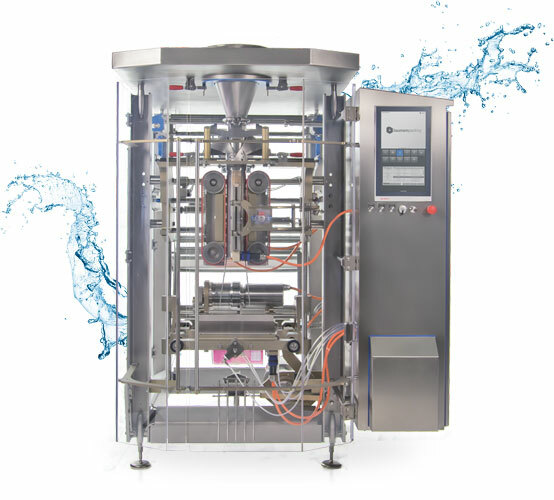 All models come with an open-frame-design without any hollow section profiles, tilted horizontal surfaces, optional stainless steel servo-drives and gear boxes, ultra clean pneumatics, etc., can be applied in the various hygienic equipment levels - many useful measures to avoid cross contamination and bacterial build-up. The design is in accordance with EHEDG and FDA rules. Additional ATEX demands can be met in various levels. Sophisticated sealing systems make sure your products are securely sealed. A solid mechanical lever system applies sealing pressures of up to 6.000 N (optional up to 15.000N), depending on your application. The cross jaw drive can be equipped with servo-drive or pneumatic drive. Integrated sensitive safety detection ensures the protection of operators, product and sealing equipment. Due to their modular design concept AGILIS vffs packaging machines by baumannpacking can be freely configured to meet any speed requirement. Up to 250 machine cycles/min are possible on a single lane model, depending on your application. The drive modules are scalable, which allows a customized system without high investment. Are you looking for an off-the-shelf-solution, short delivery, reasonably priced? 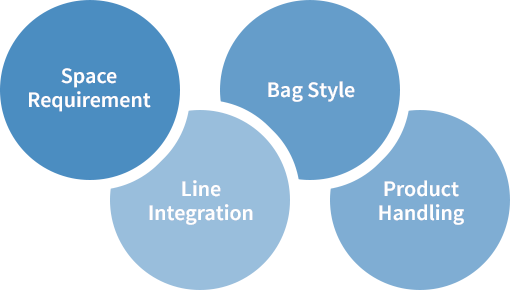 Do you have special demands in terms of bag design, limited space, line integration, that require a customized packaging solution? The answer to both questions is the AGILIS vffs packaging machine range by baumannpacking. Standardized machine modules allow short lead times at reasonable prices. The modularity allows sophisticated customizing on the other hand, so even special demands can be met in various regards. Vffs machines are the core of your primary packaging line. 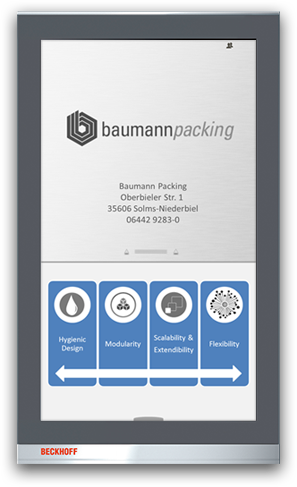 Perfect line integration therefore is a major issue in order to achieve efficient, economical and secure packaging results baumannpacking takes line responsibility and offers customized packaging line solutions or integrates existing equipment individually. Digitalization on all levels of the value-chain (Industry 4.0) demands modern solutions. The digital integration of your packaging lines is therefore absolutely essential. This fact is one of our key aspects designing AGILIS vffs packaging machines. State-of-the-art drive and control components already ensure the digital demands of the future. Easy-to-operate and comfortable HMI solutions allow remote control (also via Smart Phone or Tablet), data exchange with existing ERP systems and common operation standards like OMAC PackML. Remote service modules are integrated as standard feature to support you when ever needed. BECKHOFF drive and control components are our standard choice. Additionally we offer ROCKWELL (Allen Bradley) or SIEMENS controls, if requested. 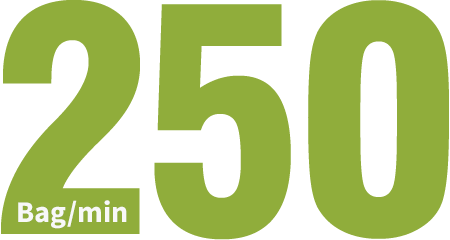 Baumann Maschinenbau Solms have more than 35 years of experience in designing and building machines. This is the platform that AGILIS vffs packaging machines are developed on. Solid mechanical base, high quality raw materials, state-of-the-art components as well as strictly user-oriented design are the essentials of these high quality products. Maximum machine availability at minimal cost of ownership is our guideline. AGILIS vffs packaging machines are exclusively designed and build in our plant in Solms - strictly “Made in Germany”.